An adult male staff member was shot by an adult visitor at Frederick Douglass High School, Baltimore City Public Schools confirmed on Twitter. 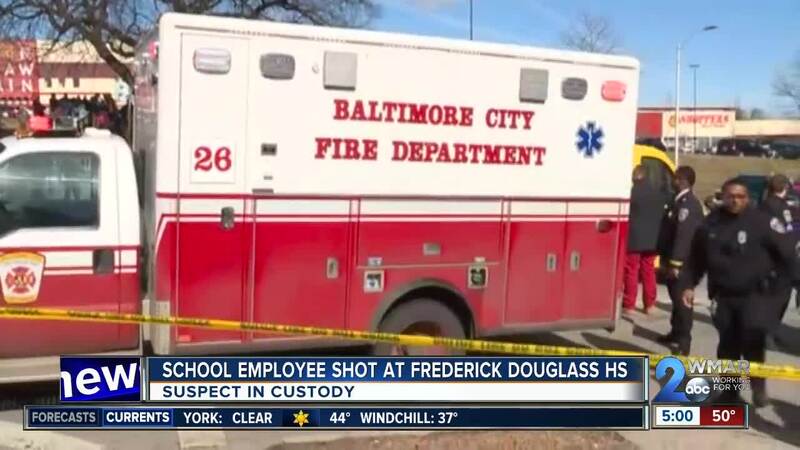 BALTIMORE — A special education assistant/hall monitor was shot by an adult visitor at Frederick Douglass High School, Baltimore City Public Schools confirmed on Twitter. The 56-year-old victim was shot by a 25-year-old visitor to the school located in the 2300 block of Gwynns Falls Parkway, said Col. Byron Conaway of the Baltimore Police. The shooter did not gain entry to the school, but shot the staff member when confronted by him in the building's vestibule. The victim was taken to the hospital for treatment. Baltimore City Schools Police apprehended the shooter immediately following the incident, city schools Police Chief Akil Hamm said. Officers had been in the main office near the front of the building at the time of the shooting and were able to take the suspect into custody without incident. The suspect was taken to Central Booking to be charged. Baltimore City Schools says the suspect is a family member of a Frederick Douglas High School student. "These were not students that are involved with this incident," Hamm said. "This was an adult male that came into the school." The school was put in lockdown following the shooting, and other staff and students are currently safe. Students were dismissed at 1:15 p.m. to enable a police investigation, the school system said. Conaway said other area schools would be dismissed "systematically." Information acquired from the school system through a Maryland Public Information Act request shows Frederick Douglass High School uses metal detectors, wants, and daily screening for students. It is one of five schools to perform all three security measures. It was not clear if everyone entering the school must undergo such security procedures or just students. Baltimore City Schools CEO Sonja Santelises issued a statement about school protocol during the shooting. She reiterated many of the details police shared earlier in the day, also updating the condition of the man shot as "serious but stable." Governor Larry Hogan took to Twitter as well, saying his team was "closely monitoring the situation at Frederick Douglass High School," his tweet read. "The state stands ready to provide any support necessary to the school, community, law enforcement, and first responders." 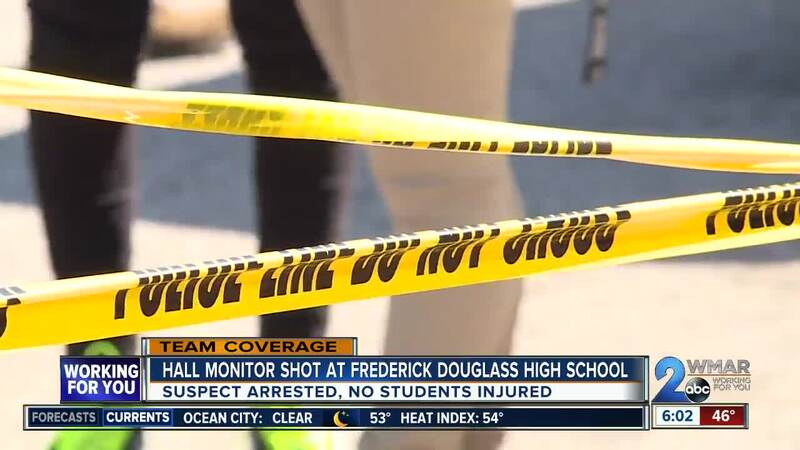 This afternoon, one of our Paraprofessionals at Frederick Douglass High School was shot by a Baltimore City resident who came into the school with the goal of doing bodily harm. 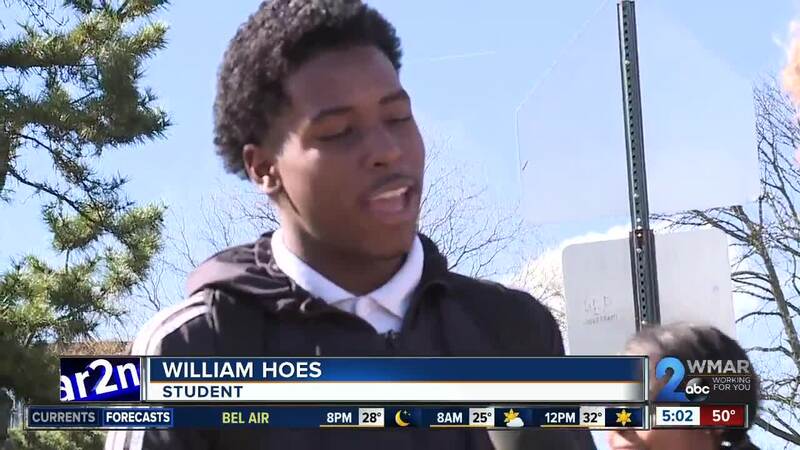 We applaud School Police for containing this situation. Their quick actions helped to keep the remainder of Frederick Douglass High School staff and students safe. We are also keeping our member in our thoughts as he continues to fight through the injuries sustained during this incident. Today’s shooting came on the heels of our third BTU School Safety Taskforce meeting held this morning, where representatives from school police, teachers, principals, and staff and students from Frederick Douglass High School, were in attendance working on our plan to make Baltimore City Schools safe. The BTU is appalled that this incident has occurred, and we will not stop until the Code of Conduct and School Culture and Climate recommendations we develop with the School Safety Taskforce are implemented.” - Marietta English, Baltimore Teachers Union President. Baltimore Mayor Catherine Pugh also released a statement stating that officials will make sure that incidents like this never happen again. It is totally unacceptable that gun violence has occurred inside a City school and our Police investigators are working to determine not only the circumstances which led to this incident but how a person with a gun was allowed to enter the school. Our schools need to be safe havens where our children can learn and achieve their potential. We will be conducting a full assessment to determine how best to prevent this type of incident from happening again.